On this page, you’ll find various resources to help you gain a better understanding of the principles of liberty. If you have ideas for additional resources to be added, send us your suggestions at info@nhliberty.org. The Philosophy of Liberty video is a classic presentation that explains the concept of self-ownership and its benefits and ramifications in easy to understand terms. 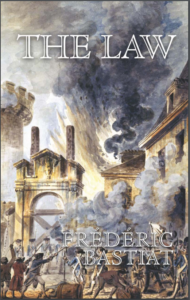 The Law is a very short read and a great starting point for understanding Liberty. It was written in the 19th century by a French philosopher and economist. This is truly a timeless essay and we highly recommend it. It should be mandatory reading for every legislator, or at least voluntary. Considered among the leading economic thinkers of the “Austrian School,” which includes Carl Menger, Ludwig von Mises, Friedrich (F.A.) Hayek, and others, Henry Hazlitt (1894-1993), was a libertarian philosopher, an economist, and a journalist. He was the founding vice-president of the Foundation for Economic Education and an early editor of The Freeman magazine, an influential libertarian publication. Hazlitt wrote Economics in One Lesson, his seminal work, in 1946. 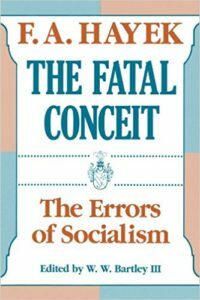 Concise and instructive, it is also deceptively prescient and far-reaching in its efforts to dissemble economic fallacies that are so prevalent they have almost become a new orthodoxy. Economic commentators across the political spectrum have credited Hazlitt with foreseeing the collapse of the global economy which occurred more than 50 years after the initial publication of Economics in One Lesson. 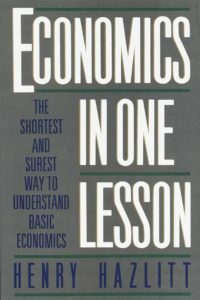 Hazlitt’s focus on non-governmental solutions, strong — and strongly reasoned — anti-deficit position, and general emphasis on free markets, economic liberty of individuals, and the dangers of government intervention make Economics in One Lesson every bit as relevant and valuable today as it has been since publication. There’s also a short video version of The Road to Serfdom that features pages from a booklet put out by General Motors. 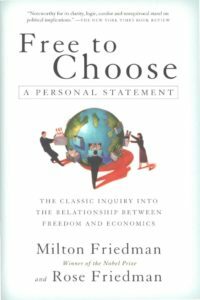 In this classic about economics, freedom, and the relationship between the two, Milton and Rose Friedman explain how our freedom has been eroded and our prosperity undermined through the explosion of laws, regulations, agencies, and spending in Washington, and how good intentions often produce deplorable results when government is the middleman. The Friedmans also provide remedies for these ills–they tell us what to do in order to expand our freedom and promote prosperity. Milton Friedman (1912–2006), was a Nobel laureate economist and former presidential adviser, was the author of a number of books, including Capitalism and Freedom and Tyranny of the Status Quo, also written with his wife, Rose Friedman (1910–2009). There is also an interesting and entertaining ten-part PBS special hosted by Milton Friedman covering the topics from the book. 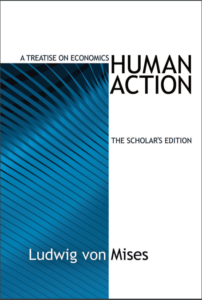 As is well known, Mises’s book is the best defense of capitalism ever written. It covers basic economics through the most advanced material. Reading this book is the best way you could ever dream up to learn economics. Every attempt to study economics should include a thorough examination of this book. Discussed and debated from time immemorial, the concept of personal liberty went without codification until the 1859 publication of On Liberty. 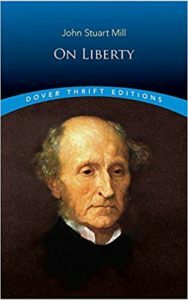 John Stuart Mill’s complete and resolute dedication to the cause of freedom inspired this treatise, an enduring work through which the concept remains well known and studied. The British economist, philosopher, and ethical theorist’s argument does not focus on “the so-called Liberty of the Will…but Civil, or Social Liberty: the nature and limits of the power which can be legitimately exercised by society over the individual.” Mill asks and answers provocative questions relating to the boundaries of social authority and individual sovereignty. 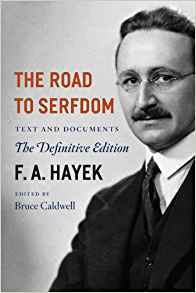 In powerful and persuasive prose, he declares that there is “one very simple principle” regarding the use of coercion in society — one may only coerce others either to defend oneself or to defend others from harm. The new edition offers students of political science and philosophy, in an inexpensive volume, one of the most influential studies on the nature of individual liberty and its role in a democratic society. Here is a short explainer video of the concepts in the book, On Liberty. Through its win-win approach, Healing Our World illustrates how the rules of social interaction which we learned as children hold the secret to universal harmony and abundance. A perfect gift for someone from the “left” side of the political spectrum. Over the span of two thousand years, the Stoic philosophy has helped men and women overcome adversity from the highest positions of power to the darkest corners of prison. 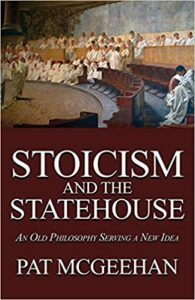 In Stoicism and the Statehouse, State Representative Pat McGeehan draws upon the classics to make the case for this durable method of reasoning to effectively advance political freedom. Designed for the liberty-oriented statesman, the moral traditions of this mental discipline are used to offer advice on how elected leaders should ethically conduct themselves underneath any capitol dome. This thought-provoking guidance incorporates wisdom from a wide mix of towering figures, both time-honored and contemporary–featuring insight from the brilliant slave-turned-philosopher Epictetus, the introspective Roman emperor Marcus Aurelius, and the heroic prisoner of war, Admiral James Stockdale. Included is a fresh look at ancient Rome’s greatest senator, Cato the Younger–a riveting biography that history fans will appreciate. The crisp explanation of Stoicism will also pique the interest of readers who enjoy early Greek and Roman thought. 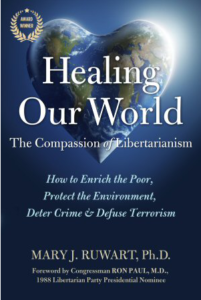 Although the author proposes a recipe to reform the politician, anyone facing personal struggles can benefit from the principles described in this book. Learn Liberty is a resource for exploring the ideas of a free society. They tackle big questions about what makes a society free or prosperous and how we can improve the world we live in. They don’t claim to have all the answers – but they’ve got a lot of ideas. By working with professors from a range of academic disciplines and letting them share their own opinions, this resource will help you explore new ways of looking for solutions to the world’s problems. Free To Choose Media is a global media 501(c)(3) public organization, that produces an array of high-quality, award-winning broadcasts that are distributed nationwide. Their programs focus on defining the human experience as one of voluntary choice, and not of forced coercion. They relay the messages of individual freedom through a fresh perspective on topics like economics, welfare, education, taxes, law enforcement, and the military. They discover stories that show all messages of freedom, through the experiences of real people. Their production teams travel the globe in search of only the most compelling stories. Stossel in the Classroom videos are created to encourage critical thinking in schools. By making it easy for teachers to include a fresh perspective in their classroom, these videos have inspired millions of students to expand their understanding of free markets, and of life. Ron Paul curriculum is non-partisan and non-political. It’s pro-free enterprise and pro-business. They teach high school students how to create a home business. If you are looking for a curriculum that is academically rigorous, yet frees up parents from the tasks of creating daily lesson plans and hands-on teaching, this curriculum is for you. To understand how this curriculum works, click here. FEE’s mission is to inspire, educate, and connect future leaders with the economic, ethical, and legal principles of a free society.